The FTD Bright Lights Bouquet brings color and beauty straight to your special recipients door! 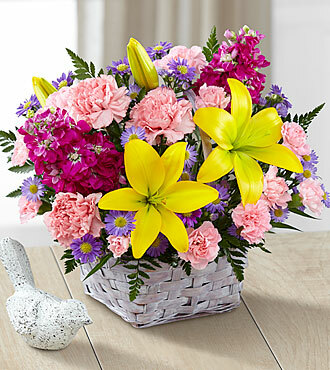 Yellow Asiatic lilies, pink roses, purple stock, lavender monte casino asters, pink carnations, pink mini carnations and lush greens are brought together to create a sweetly fascinating flower arrangement. Presented in a square lavender pastel washed basket, this fresh flower bouquet is set to make an excellent birthday, thank you or get well gift.